How to find homebrew deals on craigslist | Because beer. Craigslist can be a great place for finding deals on brewing gear if you know how to look. It can also be a bottomless pit of time-wasting if you don’t. Refine your search(es) try looking for the specific model number as opposed to the generic name. It’ll be a lot easier to see that there are no results than to sort through 4 pages of bad results. Include misspellings and alternate terms. People often post from cell phones and don’t put much effort into spell checking. Try some misspellings and see what you can get. Kegorator and cornie are two that come to mind. Get creative. Expand your number of CL sites. Is there a city an hour away that has its own CL site? Try there. Depending on how big of a purchase an even longer drive may be warranted. 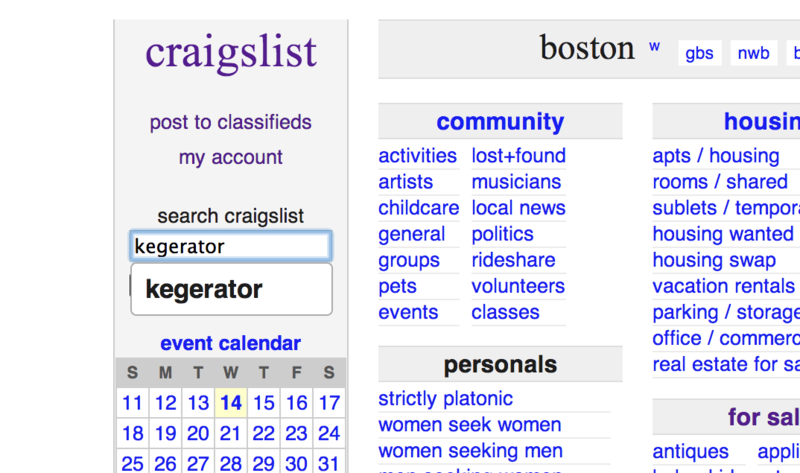 Check out this mac app that I wrote to do multi site Craigslist searches. Save your searches as bookmarks. That way you can open them up a slew of bookmarks as tabs in chrome easily. Bargain when the price is high, but overbid when the price is low. If it’s a take-it-or-leave-it kind of deal then trying to negotiate them down is always a good strategy. On the other hand if it is a must-have item and the price is already screamingly low there is only one way to make them hold it for you: pay more than asking. Have cash on hand. Cash rules craigslist. It’s a race. They don’t care that you want to write them a check, or that you need to go to the atm or anything else that might slow them down. The first person to show up with the money gets to buy the thing. Know when and where you can meet for the deal to go down, and try to set that up as soon as possible. There are a lot of flakes, and being direct and clear about your interest. Reality check. Be sure to check a legit site like amazon, morebeer Adventures in Homebrewing, or northern brewer in order to make sure that the price you are paying is worth the hassle. We’ve all been tricked into overbidding before. Now’s your chance to keep it from happening. I haven’t even had one slightly sketchy situation on Craigslist and I’ve bought and sold a lot of things, but that doesn’t mean that every deal is well-intentioned and safe. Meet in public, bring exact change, and be aware of your surroundings. Tell someone where you are going and to meet who.